You’re offering the world your talents. Wanting to leave your mark. You are… a Creative Warrior. Is your website speaking the right LINGO of your ideal customers? Often it’s not which is why you’re not attracting your most profitable customers. Fill out the application below and I’ll take a look at your website. If I have suggestions for you (I almost always do), we’ll hop on a complimentary 30-minute call. Fill out the LINGO Review application here! We are dedicated to serving and supporting service-based professionals who are in business marketing themselves and their talent. To make the journey more joyous and the path more profitable. We believe it is professionals like you– creative, talented, and eager to serve others that will transform our world. We call it The New Renaissance. A time when artists, coaches, designers, authors, speakers and other purpose-driven entrepreneurs will run profitable businesses, be highly respected for their talents and free to express their work across a variety of mediums. A believer that transformation requires inspiration and implementation, it is my intention to offer a new way of thinking about business as well as effective business practices. Both a visionary and strategic thinker, I encourage others to follow a quest that is bigger than they can imagine with measurable action steps to make that quest a reality. To find out about more support for your business, organization or event, please visit Jeffrey’s personal site. “Being a warrior is not about conquering. “Prosperity is not something we achieve. The fastest, easiest, and most profitable way to have a successful business is to work with your ideal customers. They value your offering and pay you what it’s worth and they are a joy to serve. But how can you rise above the noise in a crowded marketplace to attract these customers? You learn to speak their secret language. 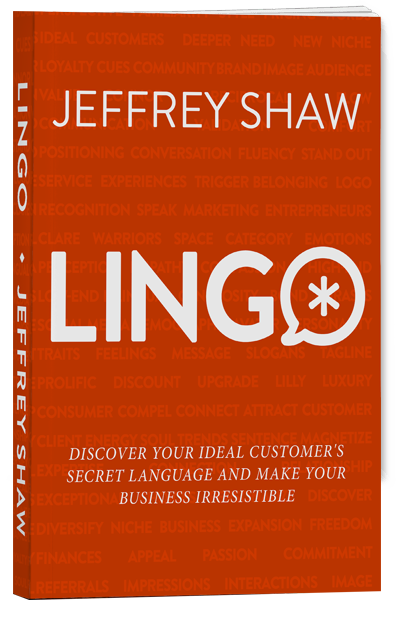 In LINGO, serial entrepreneur, business coach, and host of Creative Warriors podcast, Jeffrey Shaw reveals how to make your business irresistible to your ideal customers by showing them that you “get” them. With game-changing insights, practical action steps, and relatable examples, Jeffrey Shaw opens a groundbreaking conversation to make business easier, more profitable, and more positively impactful for any entrepreneur. We love to connect! Please let us know how we can support your dreams. HOORAY! Your Message Has Been Sent! That is my wish for you. That you create with passion, serve with all your might and live a prosperous life.